Plop Boot Manager is a small program to boot different operating systems and for chain-loading other partition boot codes. By default Plop will shoe you all primary partitions of that disk where you have installed Plop to MBR codes but you can also chain-load extended partitions also. # which other boot-loader you can chain-load? 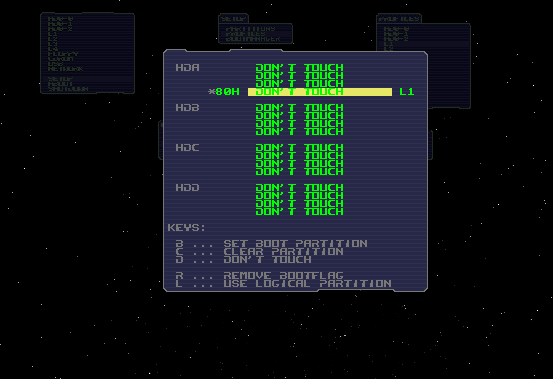 # Important main menu Hot-keys. 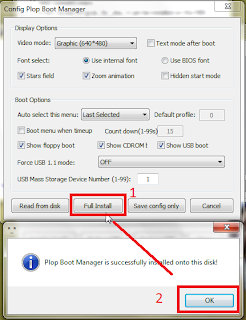 # How to install Plop to USB ? # installing plop using Syslinux/Isolinux/Extlinux/Grub4dos/Grub2/DOS/Lilo boot-loaders. # General terms and definitions. # How to chain-load operating systems from primary partitions using plop? # How to chain-load Operating system from Extended partitions using plop? # How to boot from USB Drive or Flash memory card , if BIOS not support booting from USB? #>> How to configure windows to boot using plop. -->> plop is very useful and very popular boot loader, if you take a look about its features than i think you will be able to think about, why use Plop. like, plop make possible to boot from network, USB, floppy,even if your BIOS does not gives you this power, and you can add up to 16 boot entries into plop boot menu. 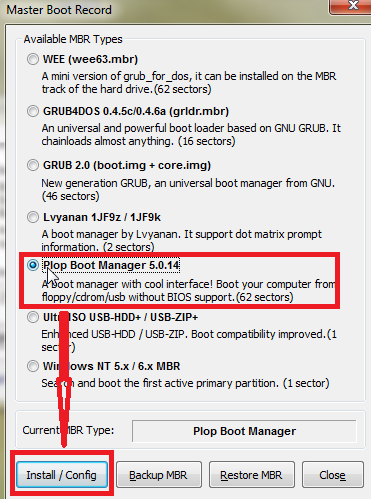 so using plop you can customize your MULTIPART-MULTIBOOT USB or you can extend the features of your BIOS. #3. which other boot-loader you can chain-load. -->> you can chain-load any boot loader using plop which are listed below. #4. 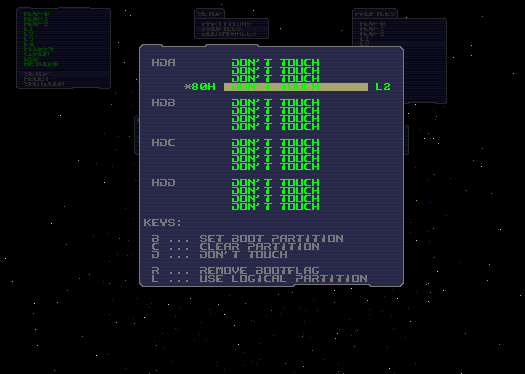 Important main menu Hot-keys. #5. How to install Plop to USB . 2. extract ZIP archive to any folder. 3. open your Linux konsole and install plop using Linux executable files under the extracted folder. 4. after extracting the files, folder tree will looks like this. #6. Chain-loading plop using other boot-loaders. #7. General terms and definitions. This is used to change the values of partitions in the MBR. BP means boot manager partition. This values are stored in the boot manager. P1-P4 this are the current values of the primary partitions in the MBR. You can edit the hexadecimal values in the partition table. select a row with s (select) and paste the values to the row where the cursor is with p. With this function, you can import partition values to the boot manager or change values in the MBR. 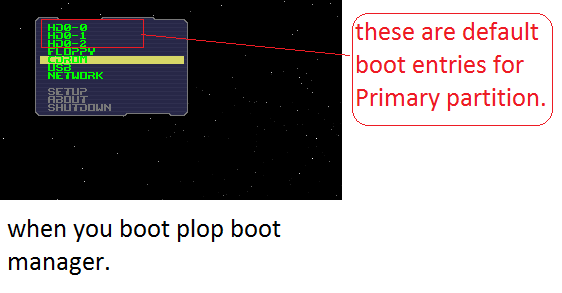 By default plop will shoe only primary partitions in boot menu, but you can add what you want. b >> set boot partition. ~ You select, what partition you want to boot with this profile. The boot manager set a bios drive number automatically. It's possible to change it with another key. 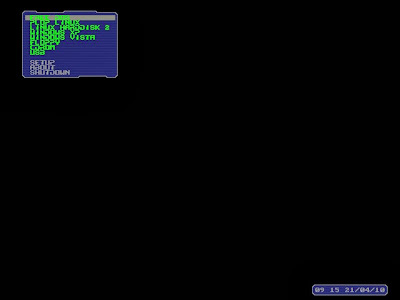 You set this entry to "cleared" and the boot manager clears this entry in the MBR when you boot this profile. You set the entry to don't touch and the boot manager does not change this entry when you boot this profile. e >> edit boot flag. The boot flag has the bios drive number used by the boot sector routine. In some cases it's required to change this value. r >> remove boot flag. Here, you remove the boot flag from the profile. l >> set logical partition. ~ Setup the master password. Disable the boot manager password protection with an empty password. ~ Setup the setup password. Disable the boot manager setup password protection with an empty password. ~ Profiles are used to start different operating systems from different hard disks and partitions. It's also possible to detect changes in the MBR made by other software and import or forget the changes. ~ Clearing the data means clearing of the partition data in the boot manager. 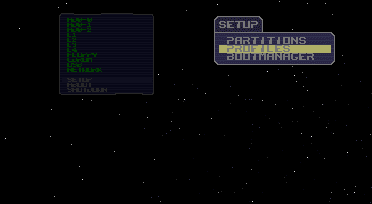 The data on the partition itself is unchanged. 1. After installing plop to MBR of your Hard-drive or other memory device, when you try to boot from usb than by default it will show you all primary partitions of your usb/memory device. 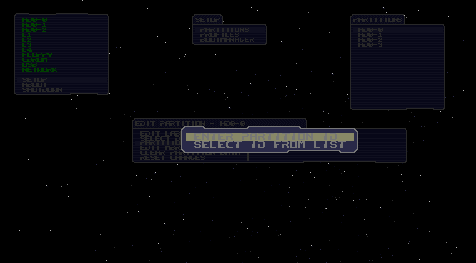 and you can select any one them from the boot entries. 2. If you are facing any problem than the main reason will be the PBR boot codes. PBR stands for partition boot record , boot codes. 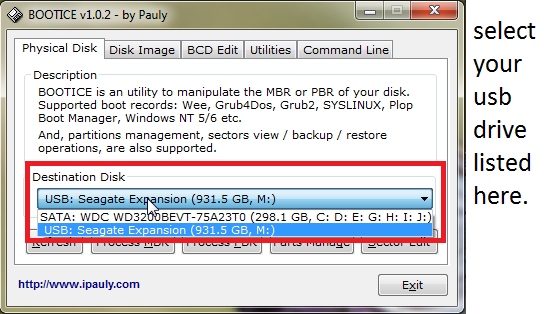 3. hence, you have to install proper boot-codes that particular partition of your usb drive. select your memory device >> process PBR >> choose any one boot loader and install to that particular partition . 1. first of all, install appropriate PBR boot codes to that partition , which are required to boot that operating system without any other boot-loader. 2. for example, if you want to run LinuxMINT than you have to install GRUB2 to PBR of that partition where you have installed LinuxMINT. If you want to boot Windows-vista/7/8/8.1 than you have to install " BOOTMGR boot record " into that partition where you earlier installed windows. 3. here I will show you how to configure plop to chain-load from a logical partition. 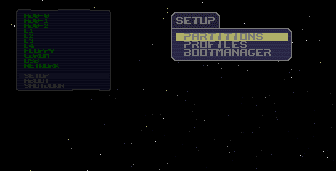 ~ Set-up >> Profiles >> move the cursor to a blank entry ( using up/down keys) and press enter. ~ Edit label >> fill a name for boot menu. ~ Linked partitions >>before proceeding towards this step , first check the steps below. -->> find out the number of that extended partition, ( go to Setup >> Partitions >> select any partition and press enter, here you will see the properties of that partition, which is just front of the menu "Partition ID". ~ Linked Partition >> In " HDA main menu" >> move the cursor to fourth label and press ' B ' hot-key ( set boot partition ) and than press ' L ' hot-key ( use logical partition ), press ' L ' continuously until you get that particular logical partition , defined as " L1, L2, L3, L4". ~ press "ESC" and again "ESC" , plop will prompt you to save the new configuration settings. press " Y " and move to main boot menu. ~ now you can see the boot entry which we add just while. 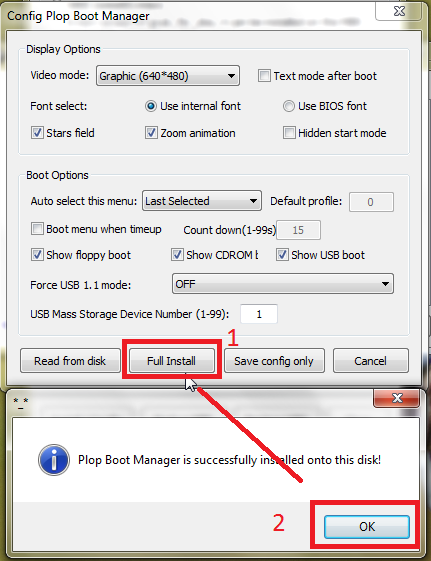 ~ Install plop to the MBR boot codes of your PC/Laptop internal Hard drive. ~ configure plop to boot your pre-installed operating systems. 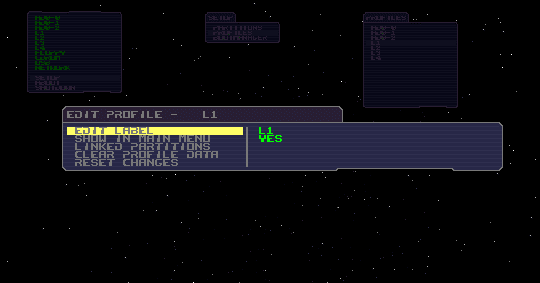 ~ press ' B ' key or just enter the " USB " sub-menu in the main menu. 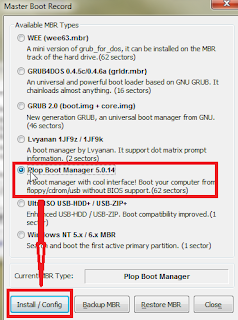 ~ Install plop to MBR boot record of Internal hard Drive. ~ reboot >> plop main menu appears >> go to set-up >> profiles >> Edit labels >> rename according to your operating system and save the configuration so that when you again boot your system than you will not confuse which boot entry belong to windows 7 or which belong to Linux. I will discuss later how i made this using only two small utility Bootice and Plop.